SAP Hybris offers innovative solutions enabling our customers to deliver contextual, consistent and relevant experiences regardless of channel or device throughout the customer journey. In this series of webinars, experts explain how you can easily implement and integrate SAP Hybris solutions for customer engagement and commerce with pre-configured business processes. Learn how SAP Best Practices and SAP Rapid Deployment Solutions help you standardize your implementation projects, providing quick time to value with fast track deployment of the latest innovations. The webinar series is offered in a live virtual format and consists of four 1 hour sessions delivered by subject matter experts. The virtual sessions are delivered between May 10th and June 7th, 2017. Use the links below to attend the live virtual sessions and get the recordings after the sessions. The flexible, modular SAP Hybris Architecture enables you to transform our customers’ system of record to a system of engagement. 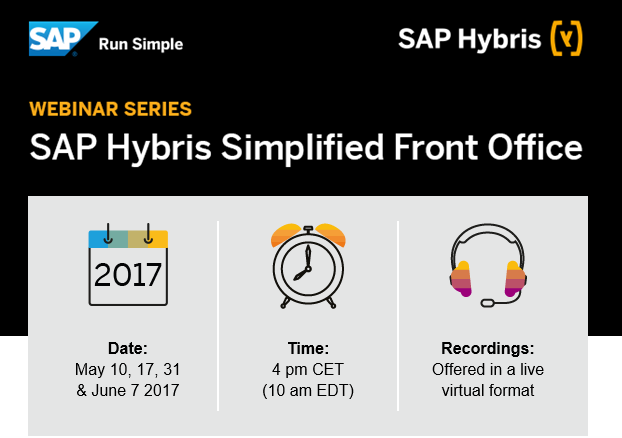 Join this very first of 5 sessions to learn how to develop your SAP Hybris front-office target architecture driven by different business ambitions and see which SAP Best Practices can support you in the implementation project. SAP Hybris Commerce and SAP Hybris Commerce Cloud offer customers in B2B and B2C business best-in-class omnichannel buying experience. Learn how preconfigured integration scenarios to various SAP solutions, that are running out of the box, can serve as a starting point for your implementation projects. Thus these preconfigured integration scenarios allow you to focus on the desired buying experience for the customers, accelerating time to market. The SAP Best Practices for SAP Hybris Billing solution includes the core features you need to monetize your services and share revenue throughout your partner ecosystem. The solution brings together the SAP Customer Relationship Management (SAP CRM) application, the SAP Hybris Billing, Charging application, the SAP Hybris Billing, Invoicing package, and the SAP Hybris Billing, customer financials package to create a comprehensive software solution that supports sales order and contract creation and the consume-to-cash business process. With these integrated solutions, you can flexibly set and charge fees in real time, optimize your billing and invoicing process, and manage receivables, payables, financial customer care, dispute management, and collections with full transparency. You can also obtain a single, complete view of customer activities. Learn more about the SAP Hybris Target Architecture HERE.